Benign bile duct stricture poses a significant challenge for gastroenterologists and general surgeons due to the inherent nature of the disease, difficulty in sustaining long-term solutions and fear of pitfalls in performing biliary tract operations. Operative management with an open biliary bypass is mainly reserved for patients who have failed multiple attempts of endoscopic and percutaneous treatments. 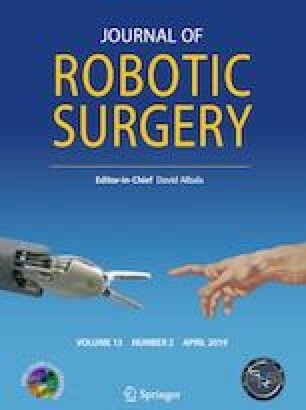 However, recent advances in minimally invasive technology, notably in the form of the robotics, have provided a new approach to tackling biliary disease. In this technical report, we describe our standardized method of robotic choledochoduodenostomy in a 59-year-old woman with history of Roux-en-Y gastric bypass who presents with benign distal common bile duct stricture following failure of non-operative management. Key steps in this approach involved adequate duodenal Kocherization, robotic portal dissection and creation of a side-to-side choledochoduodenal anastomosis. The operative time was 200 min with no intraoperative complications and estimated blood loss was less than 50 mL. No abdominal drains were placed. The patient was discharged home on postoperative day 1 tolerating regular diet and able to resume her usual activities within 1 week of her operation. A video is attached to this report. The online version of this article ( https://doi.org/10.1007/s11701-019-00957-8) contains supplementary material, which is available to authorized users. This paper was not funded in part or in whole by any organization. Annie Laurie Benzie MD, Iswanto Sucandy MD, Janelle Spence BA, Sharona Ross MD and Alexander Rosemurgy MD declare that they have no conflict of interest to report with this study. Written informed consent was obtained from the patient for publication of this study. A copy of the written consent is available for review upon request.